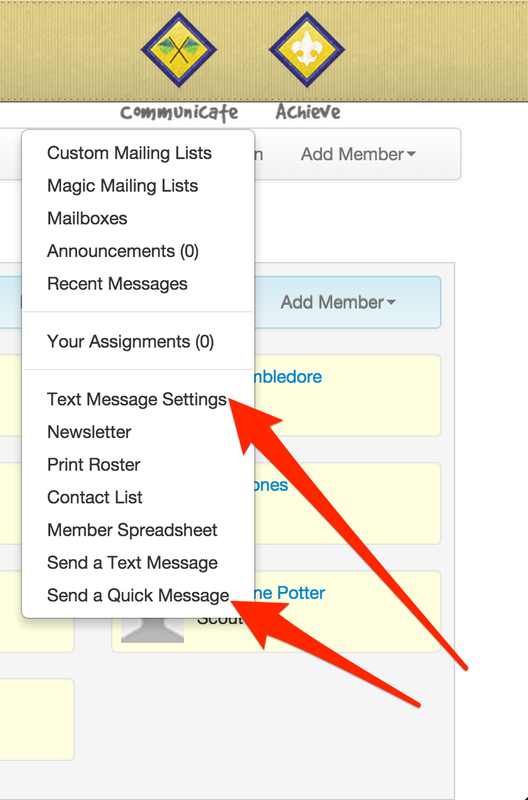 This morning I released a new feature that allows you to send text messages to any of your mailing lists. You will now see two new options under the Communicate Badge: Text Message Settings and Send a Text Message. Before you send any text messages, you'll want to use the Text Message Settings page to make sure your cell phone information is correct. Without the cell carrier info, we won't be able to deliver text messages to your members. It's important to note that immediate delivery of text messages sent this way is not guaranteed by TroopTrack or by the cell phone carriers. That's because this service (like all free text services) rely on email for delivery to the carrier, and email deliver is not guaranteed to be immediate. Email delivery is generally very fast, but occasionally there are hiccups that can cause email delivery to be delayed for hours or, even more rarely, days. Eventually the TroopTrack mobile app (currently in BETA) will support push notifications which will not rely on email and will be virtually instantaneous. In the meantime, we really hope you find the text messaging service useful. I made a lot of nice progress on using PayPal to deposit money into troop accounts this week. Up next, I will add the ability to pay for events with PayPal and then we will release it for you to try it out. Unless something unplanned occurs, payments with PayPal should be in your hands sometime in July. We pushed some bug fixes live this morning, including a fix and performance improvement for the Achieve -> Overview page for Packs. The most important bug fix is to the "None" Access Level. Previously this did nothing and was essentially the same as the "Self" access level. Now, NONE MEANS NONE. So... if you give someone an access level of None, they will not be able to interact with your unit's TroopTrack account at all. As part of this, we changed the access level for anyone with "None" to "Self", since previously these two values were the same and we didn't want to freak out a lot of people who could previously see their own records by suddenly giving them no access at all. If you have previously set someone's access level to "None" with the intent of denying them all access to TroopTrack for your unit, you will need to do it again. Going live right now - improvements to events! Yesterday we officially kicked off the beta program for TroopTrack Mobile for iOS. If you'd like to give it a try, send an email to coleman@trooptrack.com and we will add you. The new Cub Scout program is officially live today, and TroopTrack is totally ready to go. Check out this video showing how the new program is supported in TroopTrack. Yesterday I pushed an update to the way we print award cards. You'll notice that it will no longer open in the browser, but instead will download a file. That's because different browsers handle margins on PDFs displayed in the browser differently (UGH!). Safari was left-justifying them, Chrome was centering them, etc... So we had to turn off the ability to display them in the browser. This makes it line up with the perforated award cards much more consistently. If you've had trouble with award cards not aligning with our perforated award card paper in the past, please give this a try and let us know if you have any further problems. Slideshows, by popular demand... going live right now. Check it out in the video below. Also, less obviously but very important... improvements to the stability of our email distribution list processor. While we still can't guarantee the immediate delivery of email messages, we have found a solution to the occasional long delays (4 hours plus) of email messages. We have also fixed a bug where emails sent to a list by a valid email address of a user who isn't authorized to use the list were not responded to by the server. These users will now get a "sorry you aren't authorized to use this list" email message. A few weeks ago BSA announced the acquisition of ScoutBook.com, a web site that purports to be “Next Generation Scout Unit Advancement Software”. Many TroopTrack customers have asked how this affects TroopTrack, what the differences are between ScoutBook and TroopTrack, and other questions. We discussed this as a team and felt it would be a good idea to address these issues publicly for everyone at once. So here are our thoughts about the acquisition as of May 3, 2015. First of all, we believe that competition in the scout unit management software industry is good for scouters. Without competition, software companies simply don’t try as hard, and when the companies that make software for scouters don’t try, the products languish and scouting suffers. We’ve learned a lot from our competition and we intend to continue to push scouting software forward just like we have since 2008. The Boy Scouts of America acquired ScoutBook. Among other things, that’s a huge endorsement and is a major marketing advantage for ScoutBook. At TroopTrack, we aren’t going to bury our heads in the sand about that. This is going to be a big boost for ScoutBook, even more than the ScoutNET Certification Program was a big boost for TroopMaster. That said, being acquired by the BSA doesn’t mean ScoutBook is the best. It also doesn’t ensure ScoutBook will be around in five years. It merely means that BSA owns it, and the simple fact of the matter is that BSA hasn’t exactly been the best steward of its software products over the last 30 years. Only time will tell if BSA will do a better job with ScoutBook than it has done with other software projects in the past. We are skeptical of BSA’s capability to build and support a modern software platform. I don’t think there is any point hiding the fact that we are discouraged by BSA’s decision to acquire ScoutBook. It will definitely hurt our growth in the short term. We are already seeing some customers leave TroopTrack for ScoutBook, and that obviously makes us sad. ScoutBook is optimized for small mobile devices. ScoutBook is easy to use on an iPhone or similarly sized mobile device, and that has proven to be very popular. We have learned from these strategies. We will definitely continue our efforts to make TroopTrack easy to use on a mobile device, and we will continue to update our user interface to make it more familiar to scouters while respecting the BSA’s copyright and licensing guidelines as we understand them. TroopTrack is financially secure. We have been profitable for many, many years and are positioned well to endure any short term setbacks the acquisition of ScoutBook could cause for us. BSA’s announcement about the acquisition of ScoutBook touts the fact that Shawn Jackson, ScoutBook’s creator, is a unit leader. This irritates me, and maybe I’m being prickly, but there’s nothing unique about that. Every software company in this industry is led by a scouter, as far as I can tell. Four are former Scouts. Two of the other three are ladies. The point is, we are Scouters too. We’re committed to Scouting and actively involved in Scouting. ScoutBook is optimized for small mobile devices, not monitors. I’ve spent a good deal of time playing with ScoutBook on my iPhone lately, trying to understand it’s appeal beyond the extremely persuasive marketing it has done. The fact of the matter is that ScoutBook is pretty easy to use on a small mobile device. That is undeniable - it’s what ScoutBook is optimized for. I have also spent some time playing with it on my laptop and my 27 inch monitor. I know that having a screen that big is a bit nerdy, but I was curious about what sort of approach ScoutBook had taken to make their product adapt to different sized screens. The results surprised me. ScoutBook doesn’t adapt to the size of your screen at all. It merely gets wider. I’ve included a screen shot of the mobile version of a user profile accompanied by the same page viewed on my laptop. This may not matter to most people, but it would matter to me. TroopTrack uses a different approach that we believe is better. We optimize your experience based on the size of your device. That means that we adjust your experience on a small device to make it easy to use without sacrificing the way it works on a larger screen. I’ve attached comparison screenshots below to illustrate this difference. 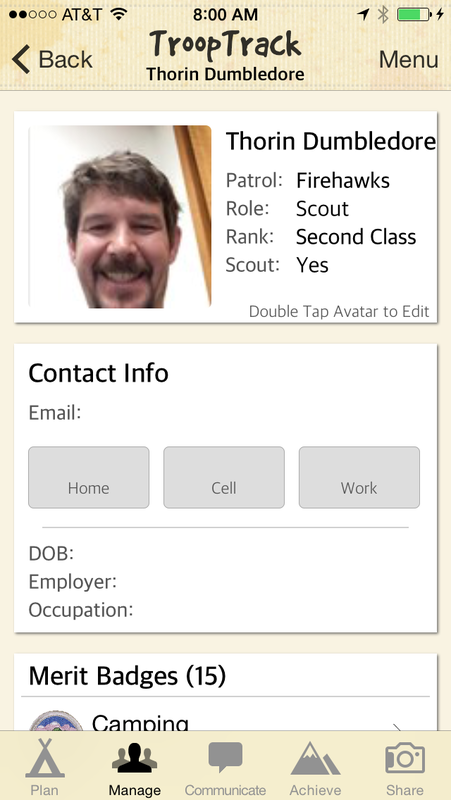 We are committed to making TroopTrack just as easy to use on a mobile device as ScoutBook. We started releasing improvements to our mobile interface a few months ago and we will continue this effort relentlessly, but we won’t do it in a way that ruins the experience of a person using a larger device. ScoutBook allows unencrypted traffic. TroopTrack forces all traffic to be encrypted. This may sound like nerd talk, and if you get nothing else from my article, I beg you to at least take away this one point: As of May 3, 2015, ScoutBook allows your data to be transmitted across the internet unencrypted. This means that unless you are very careful about how you use ScoutBook any information submitted to them can be easily read as it crosses the internet to and from ScoutBook’s servers. This includes your user name and password, as well as information about your scouts, where they live and when they were born. You can test this yourself. Just go to ScoutBook.com and look at the url. It will have a little lock beside it. Now take the “s” out of https in the url (this removes the encryption). The lock goes away. That’s because ScoutBook accepts unencrypted traffic. Now try the same thing on your bank’s web site, or on TroopTrack.com. If you try to send unencrypted traffic to those sites, the site doesn’t allow you to turn off the encryption. When sensitive data is involved, accepting unencrypted traffic is reckless, irresponsible and downright stupid. I feel no compunction in having such a strong opinion here and I will not apologize for calling it stupid. This is 2015 and there is absolutely no excuse for having such a major security flaw. fixed this very serious problem. TroopTrack does much, much more than ScoutBook. It’s not just for tracking advancement. 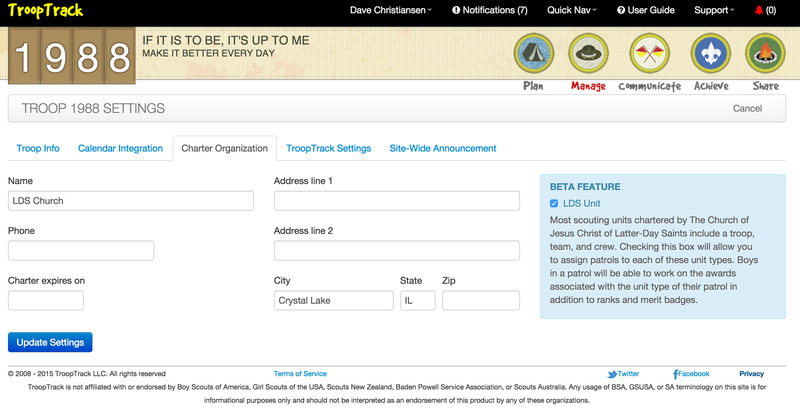 There are many features in TroopTrack that ScoutBook simply doesn’t have, at least not yet. Here’s a list of TroopTrack features that ScoutBook doesn’t have as of May 3, 2015. It’s not meant to be exhaustive and it’s possible I’ve forgotten a few. The intent is to merely illustrate the point that there is a significant feature gap between the two products. 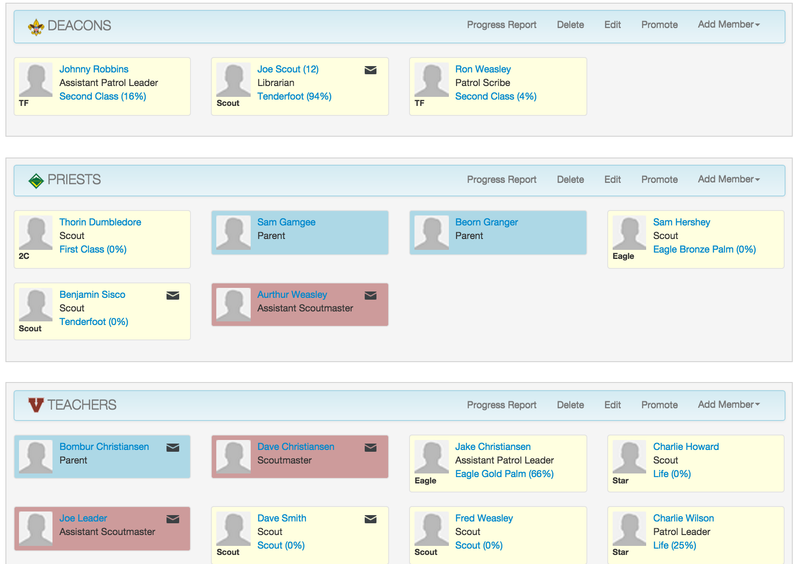 TroopTrack is a much more comprehensive solution than ScoutBook. Whether that means TroopTrack is better than ScoutBook for your unit is something you have to decide, but we are committed to doing whatever we need to do not only do more than ScoutBook, but to also do it better. The big question about the acquisition of ScoutBook for TroopTrack has been how we will respond. So I’m going to put it simply: we are going to continue pushing forward. We aren’t giving up or going away. We are going to learn from the things that are good about ScoutBook and ignore the things that aren’t. We are as committed as ever to building the best Unit Management Software on the Planet. * A brief aside about #2: It’s unclear whether ScoutBook had permission to use BSA’s copyrighted imagery on their website when prior to being acquired by BSA. We suspect they did not, since the footer of ScoutBook.com originally said they had no relationship with the BSA. Typically it would have said something like “Images used with permission of Boy Scouts of America” if they had obtained formal approval to use the artwork. This is totally speculation on my part, but I wonder if ScoutBook’s flagrant violation of BSA copyrights somehow led to BSA’s acquisition of the software. Table sorting on user profiles is back, finally. We had to remove it about a year ago because it wasn't interacting well with the tabs on the user profile, but we've since re-designed those tabs so that they work properly with the sort widget. Now, every table on the user profile tabs has little triangles at the top so that you can sort by that column. This morning we deployed a number of updates to TroopTrack. - A more robust way of handling distribution list emails sent from your email account (not quick message) so that unicode characters, such as emoji, will be handled appropriately. - Minor change to the troop settings to remove a duplicate setting that was causing confusion. We also deployed a number of changes to the API that is used by the mobile app and continue to make great progress. We are currently working on a feature called "offline mode" so that you can access your troop data even when you don't have internet access. We've completed entering the varsity awards, available only if you turn the "LDS Unit" troop setting on. Here's a list of all the awards available for use by LDS scouting units. 1) There will be a new troop setting called "LDS Unit". This setting must be checked to turn these new features on. 2) Patrols can be associated with a unit - troop, team, or crew. 3) Youth in a patrol that is associated with a team or crew will have all scouting awards available plus the awards for teams/crews. Along with this change, we will also be releasing a re-design of the troop settings to make it easier to use. This re-design will be for all customers, not just LDS units. Releasing this feature will also kick off our effort to update the Venturing program and add in all the Varsity awards. You should start seeing those awards late next week or the week after. 1) Shipping on blue cards and award cards was reduced from $10 per packet to $6 per packet. This was the result of evaluating shipping options with the USPS and figuring out that we can barely fit a packet into a flat rate envelope. 2) The logic for determining if you are ready to accept online payments was enhanced to avoid error conditions. The links for depositing funds into money accounts and the ability to purchase tickets to events will not be available if you haven't selected a payment provider and a default money account. 3) We have removed Amazon from the payment provider list. Amazon has decided to retire their current payment processing solution on June 1st and replace it with an entirely different service. We are still evaluating whether we will support the new Amazon service, but in the meantime we are not allowing any additional troops to sign up for Amazon Payments. All troops currently using Amazon Payments will be able to continue to do so until June when Amazon shuts the service down. At that time they will need to pick a different provider. Related to #3... we are going to start work on adding support for using PayPal to accept payments online. We'll keep you posted as we progress with this integration.